Remember the huge Occupy movement last year? Millions of Americans abandoned their traditional banks for their local credit unions. Fed up with new fees by the big banks, those folks did the only thing they could: they let their money – and their loyalty – do the talking. Now, there’s a another new movement that suggests those same consumers are abandoning their credit cards issued from the big banks and instead are turning to their credit union for their credit card needs. You may recall this all began last year after Bank of America and other big banks announced debit card usage fees. Bank of America’s $5 debit card fee put consumers over the edge. They felt they were already paying banks to keep their money and they weren’t going to pay to have those same banks release their own money via ATMs and debit card purchases. Now that they’ve settled in with their credit unions, they’re now realizing the growing number of fees associated with using their credit cards. Again, they feel they’re being held hostage and despite the new laws, such as the 2009 CARD Act, it appears the banks are operating within those new compliance laws. So now, they’re taking a closer look at credit unions. They offer credit cards with many of the same perks provided by the big banks; they also come with unique benefits and different restrictions. In other words, consumers are weighing their options and it’s all about the fee structures. For them, it’s all about taking their financial futures into their own hands. The average rates on credit union credit cards are often several percentage points below those offered at big banks. There are typically no balance transfer fees, the late fees are generally lower and most credit union credit cards offer more of a grace period before payments are considered late. The icing on the cake, however, is that the interest rates offered by credit unions are capped, something banks and the credit card networks aren’t bound by. Meanwhile, all of the perks and benefits are still right there where they’ve always been. So with all of these benefits, why isn’t everyone turning to credit unions for their credit card needs? There are a few reasons. 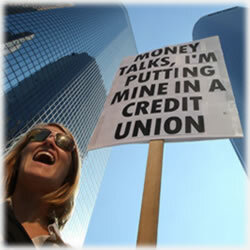 The biggest reason is that credit unions tend to be far more careful about their approval process. They can pick and choose who their customers are and they don’t answer to massive, overpaid board members. That said, they are also bound by all of the rules in the banking and financial sectors so those consumers who do opt for credit unions have the same protections as other bank customers. Also, if your bank approved credit card account with a $5,000 credit limit, odds are, that same offer at a credit union might come with only a $3,000 credit limit. Now, credit unions keep closer eyes on their accounts, which means they raise those credit limits more often, but because they’re taking (in some ways), bigger risks, they have to carefully vet those leaps of faith. Finally, it’s important to keep in mind that not all credit unions offer credit card products; in fact, only about half of the 7,300 credit unions in the U.S. offer their members these products. Regardless of what you ultimately choose, you should know there are some great credit card offers out there. The Chase Disney Premier Visa is one example of what an all around perk-filled credit card should look like. The annual fee is only $49 and there’s an intro 0% APR for six months on many of Disney’s vacation packages. You’ll earn a $100 Disney gift card after spending just $500 during the first ninety days of opening your credit card account, 2% in rewards dollars when you shop at gas stations, grocery stores, Disney owned locations and restaurants. All other purchases earn you 1% in rewards dollars. You’ll save when you shop the Disney Store and you’ll really enjoy the ease in which to redeem rewards for theme park tickets, Disney toys, vacations at Disney resorts and much more. For those with little ones or those who are enjoying their grandbabies, this is a fine co-branded credit card offer. The Discover More card is still a classic favorite. There’s a reason Discover consistently ranks high in consumer satisfaction. It’s great offers, incredibly helpful and patient customer service team and its extended intro periods and rewards programs are just a few of those many reasons. With guaranteed around the clock access to account managers within sixty seconds to no annual fees, this is a choice that’s easily made for millions of consumers. You’ll also never worry about paying for a second card for your spouse or kids, there are no rewards redemption fees and the 20% cashback bonuses in its rewards categories all add up to fantastic savings. Ultimately, only you can decide what’s best for your financial needs. The good news is that consumers have more options now than ever before. And if anyone was worried these new laws would significantly limit their options, by now, that concern should have been laid to rest. Never before has the power been in the consumer’s collective hand. As always, though, be sure to check your credit reports before applying for a credit card or any other kind of loan, and be sure to read the terms and conditions completely. Because of those new laws, there are new considerations and those will always be found in the so-called small print of a credit application. Were you one of the ones who opted for a credit union in the past year? What has your experience been like? Share your story with us and our readers.